NASHVILLE – April 6, 2016 — Gov. Bill Haslam, Lt. Gov. Ron Ramsey, Speaker of the House Beth Harwell, Rep. Steve McDaniel, chairman of the Douglas Henry State Museum Commission, Lois Riggins-Ezzell, executive director of the Tennessee State Museum, and Jon Meacham, Pulitzer prize winner and New York Times bestselling author, were on hand today to break ground on the new Tennessee State Museum. The project represents a bold vision – part museum, part virtual reality and part time machine. “What we’re planning to accomplish with a new state museum is a 100-year project — in terms of both quality and stature, and I want to thank the General Assembly for its partnership and commitment to make this investment,” Haslam said. “We’re taking an innovative, hybrid approach to the museum’s design that will be an extraordinary experience and will complement the other cultural and entertainment opportunities Tennessee has to offer. This entry was posted in Tennessee History and tagged museum, tennessee hist on April 6, 2016 by Tom Humphrey. 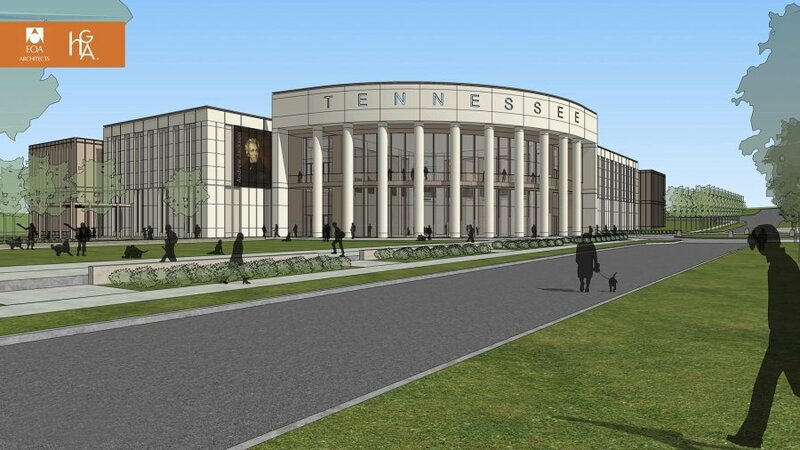 Tennessee State Museum commissioners on Monday saw a conceptual design presentation for a new $160 million facility before later arguing over how quickly to replace the museum’s longtime director, Lois Riggins-Ezzell. Meanwhile, Riggins-Ezzell was named a non-voting member of the very search committee named to replace her. She later told reporters she doesn’t want to leave the post she’s held for 35 years. Earlier, members of the Douglas Henry State Museum Commission heard from presentations from project coordinator Mark Cate, former chief of staff to Gov. Bill Haslam. The governor is taking the lead role on raising $40 million that will supplement a $120 million state appropriation approved last year for the facility. The new building will replace the current museum housed in the basement of the James K. Polk State Office Building. Work is scheduled to begin this spring. Museum commissioners also heard from Patrick Gallagher, president of Gallagher & Associates, whose firm is designing the exhibit experience for the 50,000-square-foot building that will go up on the state’s Bicentennial Mall near the state Capitol. “This could easily be a multi-day experience for visitors,” said Gallagher, as he described various galleries with artifacts and interactive displays outlining Tennessee history, culture and more. He also presented conceptual drawings, which officials stressed were not yet set in concrete. Commissioners later followed up on their October meeting where they agreed to begin a succession plan for Riggins-Ezzell. A state comptroller’s performance audit last year raised concerns about the lack of a succession plan while the new $160 million museum is under development. Riggins-Ezzell, meanwhile, has come under criticism for some actions and has been accused of engineering the removal of two members of the Tennessee Museum Foundation, who had raised operational and other concerns. The foundation is the chief fundraising arm of the museum for purchases of historical artifacts and art. Haslam’s Human Resources Department is helping commissioners structure the search, as well as aiding the museum on new workforce planning. This entry was posted in boards and commissions, Tennessee History, victor ashe and tagged commissions, museum, Tennessee history, victor ashe on January 12, 2016 by Tom Humphrey. 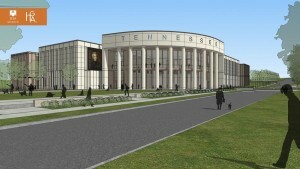 The Tennessee State Museum’s governing board agreed Monday to begin the process for replacing longtime executive director Lois Riggins-Ezzell after a new performance audit of the museum raised concerns about the lack of a succession plan while a new $160 million museum is under development, reports Richard Locker. Riggins-Ezzell has led the museum for 34 years and most of her senior management staff have also been in place for several years. The state Legislature in April approved $120 million in public funding for a new museum building on the state’s Bicentennial Capitol Mall in Nashville, to replace cramped quarters in three basement levels of a state office building where it’s been for nearly 30 years. Gov. Bill Haslam is leading an effort to raise another $40 million in private donations. Smith and state Rep. Steve McDaniel, R-Parkers Crossroads, the museum commission chairman, plan a meeting for Oct. 27 with other state officials on the process for selecting a search firm to carry out a national search for a new executive director. Riggins-Ezzell has not said when she plans to retire but told reporters this summer she hopes to remain on board, while helping transition to a new director, until the new museum’s targeted opening in 2018. …The commission also approved new guidelines for acquisitions for the museum drafted by its acquisitions committee Chairwoman Deanie Parker of Memphis. Ashe has criticized the museum staff for acquiring most of its art and artifacts from Middle Tennessee sources, with considerably fewer from East and West Tennessee. But he added that “until I see it happening, it hasn’t happened. I’m pleased the commission is moving in the right direction.” He said a proper search could take six to eight months. …Bob Thomas, the Museum Foundation’s chairman, on Monday applauded the move to begin finding a successor. Thomas also serves on Haslam’s new seven-member steering committee which is charged with raising the $40 million in private funds. This entry was posted in boards and commissions, Tennessee History and tagged commissions, museum, victor ashe on October 5, 2015 by Tom Humphrey. The state Comptroller’s Office found a series of problems in operations of the Tennessee State Museum in an audit released today, ranging from questionable hiring practices to not keeping track of alcoholic beverages kept at the museum. Mary Skinner, a spokeswoman for the museum, downplayed the audit results. The audit comes amid a controversy over whether the museum’s longtime executive director, Lois Riggins-Ezzell, should be replaced while efforts are underway to raise more than $40 million in private donations to go with $120 million in taxpayer funds allocated to building a new museum, scheduled for completion in December 2018. The audit includes at least one finding that may indicate the need for a new museum: There has been water damage to artifacts stored at the present museum. This entry was posted in boards and commissions, Comptroller and tagged audits, comptroller, museum on October 5, 2015 by Tom Humphrey. The Tennessee State Museum houses nearly 200 works of art owned by a member of the State Museum Commission, which oversees the museum, reports WTVF. The arrangement has raised concerns from another commission member about whether taxpayers are paying to store privately owned art — despite limited space and staff at the museum. Commissioner Walter Knestrick is a longtime collector of the works of Tennessee artist Red Grooms. Many of the Grooms paintings that he owns are located at the Tennessee State Museum. “Taxpayers should not pay for the storage for paintings which are privately held and no date for a final donation has been determined,” Commissioner Victor Ashe told NewsChannel 5 Investigates. But the longtime executive director of the Tennessee State Museum, Lois Riggins-Ezzell, passionately defended the arrangement. Riggins-Ezzell disputed criticism from Ashe, but was occasionally told to watch her comments by the museum’s media relations person who sat in on the interview. …Riggins-Ezell said the museum is fortunate that Knestrick loaned the art to the museum and is now in talks to gift them. “What a gift this is for the citizens of Tennessee. Who would want for the citizens of Tennessee not to have this in perpetuity?”” Riggins-Ezzell asked. But currently there is no written agreement between Knestrick and the state for him to donate the paintings. Until that time, Ashe said, its wrong they are stored, insured and displayed at museum expense. Riggins-Ezzell said the paintings don’t cost the state more to insure because it has a blanket policy. She said Knestrick and the Tennessee Attorney General are working on an official agreement to donate the works of art. This entry was posted in boards and commissions and tagged museum, state museum, Tennessee history, victor ashe on September 29, 2015 by Tom Humphrey. An audit of the Tennessee State Museum has been completed and will be presented to members of the museum’s board of directors at a scheduled meeting in Memphis on Oct. 5, according to a spokesman for Comptroller Justin Wilson. The spokesman, John Dunn, said in a copy of the draft audit by the state comptroller’s office has been provided to the museum management, including Executive Director Lois Riggins-Ezzell, for a response to findings. In accord with auditing policies, he declined to provide any information on those findings in advance. But former Knoxville Mayor Victor Ashe said he understands informally that one curious finding is that the museum management keeps alcoholic beverages on hand without properly securing them. “I didn’t even know we had alcohol there,” said Ashe, a member of the board officially known as the Douglas Henry State Museum Commission. This entry was posted in boards and commissions, Tennessee History and tagged museum, Tennessee history, victor ashe on September 28, 2015 by Tom Humphrey. Since former Knoxville Mayor Victor Ashe accused the Tennessee State Museum of geographic bias in contemporary art purchases, the museum has bought works by four East Tennessee artists — although still spending more money in Middle Tennessee, a review of records provided by the museum indicates. Ashe said he intends to raise the notion of replacing the museum’s longtime executive director, Lois Riggins-Ezzell, at a meeting of the museum board — formally known as the Douglas Henry State Museum Commission — set for Oct. 5 in Memphis. The commission’s chairman, Republican state Rep. Steve McDaniel of Parkers Crossroads, says he is open to the idea of discussing creation of a search committee to consider a successor to Riggins-Ezzell, 75, who has led the museum since 1981 and who has expressed an intention to “stay as long as I can” — at least until a planned new $160 million museum is completed and opened. That is scheduled for December 2018. This entry was posted in boards and commissions, Tennessee History and tagged art, boards, museum, Tennessee history on September 20, 2015 by Tom Humphrey. 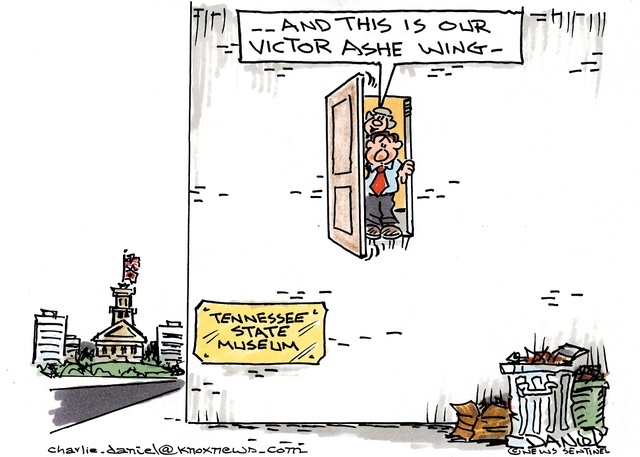 This entry was posted in Political Humor, victor ashe and tagged funny, museum, victor ashe on August 21, 2015 by Tom Humphrey. Mark Cate, who resigned Aug. 1 as Gov. Bill Haslam’s chief of staff, has since signed a $10,000-per-month contract to serve as “project coordinator” in developing a new Tennessee State Museum, scheduled to open in December, 2018. Officially, the contract is between Cate’s newly established consulting firm — Stones River Group, LLC — and the foundation, which raises money to support museum operations and is now responsible for collecting at least $41.75 million in private donations to go with $120 million in state funds allocated for building a new state museum. Effectively, Cate will be a middleman in coordinating efforts of the foundation, its fundraisers, a separate board that oversees general museum operations, the museum staff headed by veteran Executive Director Lois Riggins-Ezzell, and Haslam’s administration. The state Department of General Services is lead agency in the project for Haslam, who presided last week in a “steering committee” meeting. This entry was posted in Privatization, State employees and tagged fundraising, haslam cabinet, museum on August 20, 2015 by Tom Humphrey.